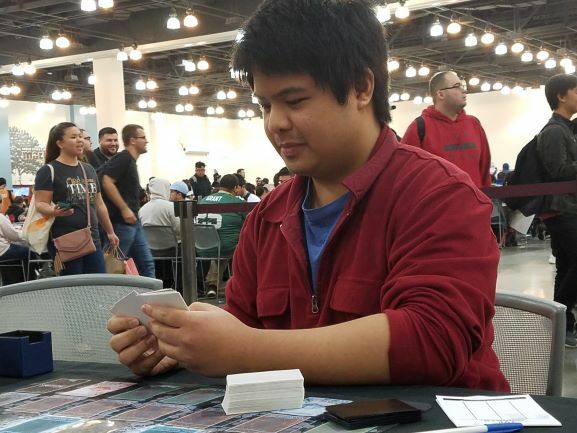 Welcome to Round 2 of YCS Pasadena! 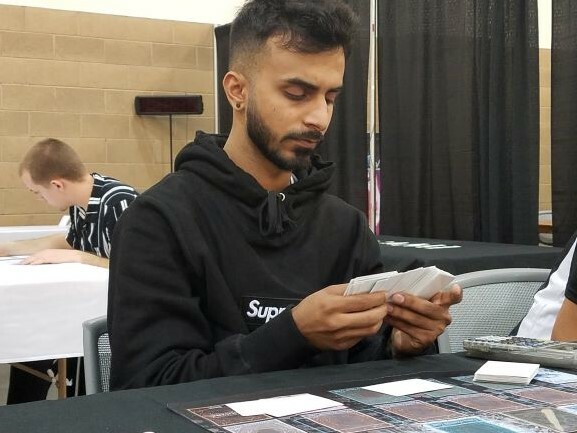 We’ve got YCS Champion Manav Dawar, from Seattle, playing a Sky Striker Deck. He’s facing off against Timothy Flores from La Habra, using the master of the Destruction Sword himself, Buster Blader! Flores’s build is a Buster Sky Striker mixed strategy, so there will be some unique interactions between these Duelists. Dawar won the dice roll land chose to play first. He led with Foolish Burial Goods to send Sky Striker Mobilize – Engage! to the Graveyard, then played Upstart Goblin. He played Sky Striker Ace – Raye and used it to Link Summon Sky Striker Ace – Kagari, adding Engage to his hand. He played Engage to get Sky Striker Mecha Modules – Multirole. He used Kagari to play Sky Striker Ace – Shizuku, activated Multirole, and Set two cards. In the End Phase, Shizuku added Sky Striker Mecha – Widow Anchor to his hand. He activated it targeting his own Shizuku. Doing so triggered Multirole, which Set Widow Anchor on the field. Flores had a hand of Called by the Grave, Prologue of the Destruction Swordsman, PSY-Frame Driver, and Buster Whelp of the Destruction Swordsman. He drew Destruction Sword Memories. He Normal Summoned Buster Whelp, adding Dragon Buster Destruction Sword to his hand. He used Buster Whelp to play Linkuriboh, and Set all his Spell and Trap Cards. Dawar used Widow Anchor to take control of Linkuriboh, then returned it immediately (changing its zone in the process, moving it to where his Shizuku was pointing and thereby limiting Flores’s Extra Deck options). Dawar started his turn, and Flores flipped Destruction Sword Memories, discarding Dragon Buster, to Special Summon Buster Blader, the Destruction Swordsman in Defense Position. 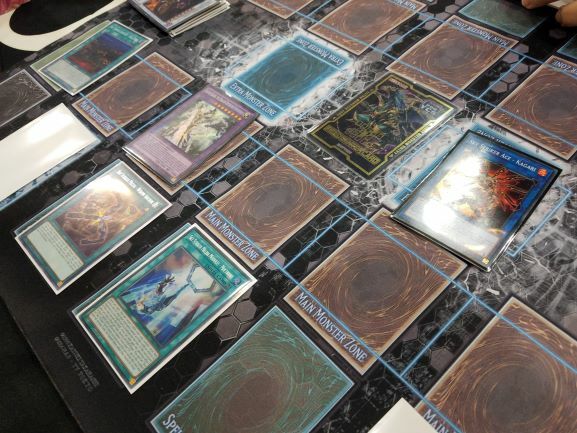 He also used Prologue, sending Buster Blader and Destruction Sword Flash to the Graveyard, to Special Summon Buster Dragon in Defense Position from his Extra Deck. He used Buster Dragon to equip Buster Blader, the Destruction Swordmaster with Dragon Buster Destruction Sword from his Graveyard. Dawar used Multirole, sending his face-down Artifact Scythe to the Graveyard. He flipped Engage to get Sky Striker Maneuver – Afterburners!, and Flores used Prologue from his Graveyard to protect his Destruction Sword cards this turn. Dawar used Afterburners to take out Buster Dragon. Shizuku attacked Linkuriboh, and Flores used Linkuriboh’s effect. Dawar Set a second back row card. Flores drew Ghost Ogre & Snow Rabbit. He flipped Prologue, sending another Swordmaster and Memories to the Graveyard and Special Summon Buster Dragon from the Extra Deck, and used it to Special Summon Swordmaster. He Special Summoned Dragon Buster Destruction Sword, and Dawar used Artifact Ignition, then flipped Widow Anchor. He took control of Buster Blader, the Destruction Swordmaster, then Special Summoned Artifact Scythe. Scythe activated, and Flores used Called by the Grave to banish the Scythe from Dawar’s Graveyard and negate the one on the field. Flores used Buster Dragon and Dragon Buster Destruction Sword to Synchro Summon Hot Red Dragon Archfiend Abyss! Hot Red destroyed Scythe in battle, and Hot Red’s effect Special Summoned Dragon Buster Destruction Sword. His Swordmaster destroyed the Swordmaster Dawar had taken. He used Dragon Buster Destruction Sword with Swordmaster for a new Buster Dragon, which brought Swordmaster back to the field. Dawar played Foolish Burial Goods, sending Metalfoes Fusion to the Graveyard, and used that to draw a card. 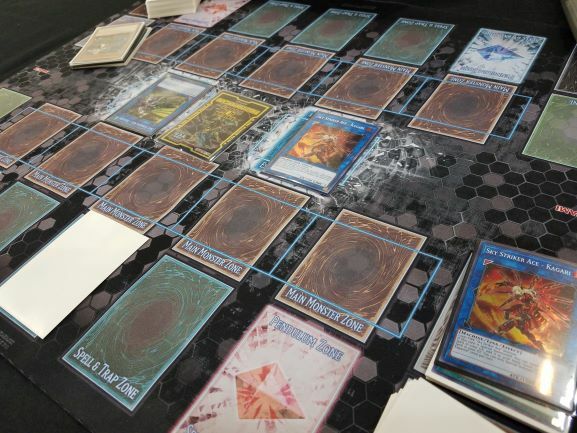 He played Sky Striker Airspace – Area Zero, using that effect on Shizuku, but Flores used Hot Red to negate it! Dawar had no other plays. Flores drew PSY-Framegear Gamma. He had Hot Red negate Shizuku and attacked it. Hot Red’s other effect Special Summoned Dragon Whelp, and Dawar Special Summoned Raye. Swordmaster destroyed Raye in battle and equipped it with its effect. Dawar drew his card, and Buster Dragon equipped Dragon Whelp with Dragon Buster Destruction Sword to shut down the Extra Deck. Dawar had no play and conceded the first Duel! Dawar chose to play second. Flores began with two copies of Sky Striker Mobilize – Engage!, Trap Trick, PSY-Framegear Gamma, and Mausoleum of White. Engage searched out Sky Striker Mecha – Hornet Drones, which he played immediately so he could Link Summon Sky Striker Ace – Kagari. Kagari returned Engage to his hand, and he played it again to get Sky Striker Mecha – Widow Anchor to his hand. He Set Widow Anchor and Trap Trick. Dawar immediately went to his Battle Phase, telegraphing Evenly Matched. Flores flipped Widow Anchor to negate his own Kagari, banishing less cards this way. But Dawar did not play Evenly Matched! He went to Main Phase 2, using Foolish Burial Goods to send Engage to the Graveyard. He played Raye and Area Zero. Area Zero targeted Raye, and he Chained Raye’s effect to Special Summon Kagari. Area Zero failed to his anything, but Kagari still returned Engage to his hand. Flores then flipped Trap Trick, taking Prologue of the Destruction Swordsman from his Deck! He used it, sending Buster Blader, the Destruction Swordmaster and Destruction Sword Memories to the Graveyard, and he Special Summoned Buster Dragon (thanks to Dawar’s Kagari’s Link Arrow). Dawar played Engage, finding Sky Striker Mecha Modules – Multirole. He activated Multirole, sending Area Zero to the Graveyard with its effect. He Chained Widow Anchor to steal Buster Dragon, and Area Zero’s effect Special Summoned Raye. He used Buster Dragon and Kagari to play Knightmare Phoenix, then used Raye to play Sky Striker Ace – Shizuku. He Set one card in his back row. In the End Phase, Shizuku searched out Sky Striker Mecha – Eagle Booster. Multirole Set Engage. Flores drew Buster Whelp of the Destruction Swordsman, and it was negated by Dawar’s Ash Blossom & Joyous Spring. He used Whelp and Kagari to play Aleister the Invoker of Madness, then used Engage to search for Widow Anchor and draw Trap Trick. Widow Anchor stole Shizuku, and he used it to play Kagari. Kagari returned Engage to his hand yet again, and Dawar flipped his own Widow Anchor to take Flores’s Kagari. Flores banished Destruction Sword Memories, fusing Swordmaster and Whelp into Buster Blader, the Dragon Destroyer Swordsman! It wiped out Knightmare Phoenix in battle. He chose not to have Aleister attack Kagari. Flores Set Trap Trick, and Kagari returned to his side of the field in the End Phase. Dawar’s Multirole Set Widow Anchor on the field in the End Phase. Dawar Set a card and used Multirole targeting it. Flores Chained Trap Trick, getting Infinite Impermanence from his Deck. Multirole resolved, sending the Set Metalfoes Fusion to the Graveyard. He then flipped Engage, getting him Afterburners and another draw. Afterburners destroyed Aleister and the Set Infinite Impermanence. He then used Metalfoes Fusion to draw another card. He Set one card face-down, then played Area Zero to use its effect, but it failed. He flipped up Widow Anchor to take Kagari, using it to play Sky Striker Ace – Hayate, and that to play his own Kagari. It returned Widow Anchor to his hand, which stole Buster Blader! Both monsters attacked directly, leaving Flores with 3300 Life Points. Dawar was leading with 7100. Dawar used Kagari to play Shizuku, which searched for Sky Striker Mecha – Shark Cannon, and he activated it to banish Buster Dragon. Multirole then Set Shark Cannon and Widow Anchor. Finally, Flores took back his Fusion Monster. Flores drew Dragon Whelp and Normal Summoned it – Dawar flipped Widow Anchor to negate it and take control for the turn. It switched to Defense Position due to the Blader’s effect. Flores sent it to attack Shizuku, and Dawar Special Summoned Raye. He then used Raye to play a new Shizuku, which searched for Engage. Dawar played Engage to get Widow Anchor and draw a card. He then Link Summoned Kagari for another Engage, which got Afterburners. He played it to destroy Dragon Whelp, then Widow Anchor negated Blader and took it, and Dawar attacked directly to take the second Duel! There was just over three minutes remaining in the round, after Side Decks were put away. Flores chose to play second, and Dawar Set two cards for his turn. Flores had a hand of Twin Twisters, Prologue, Dinowrestler Pankratops, Mausoleum of White, Engage, and Swordmaster. He discarded Mausoleum for Twin Twisters, destroying Dawar’s Heavy Storm Duster and Twin Twisters. He then used Engage to get Hornet Drones, played Kagari, and got Engage back. He played Engage again, searching for Widow Anchor and drawing Where Arf Thou?. He Set Widow Anchor and Prologue. Dawar used Twin Twisters, discarding Eagle Booster to clear Flores’s back row. He took Kagari with Widow Anchor, played Sky Striker Ace – Hayate, then played his own Kagari to return Widow Anchor. He attacked, then played SHizuku. He Set one card, and added Engage to his hand with Shizuku. Flores drew Mind Control. He Special Summoned Pankratops and had it destroy Dawar’s Set Widow Anchor. He used Mind Control to take Shizuku, played Kagari to get Engage back, and used that to get Widow Anchor and Twin Twisters. Kagari attacked directly. He Set Widow Anchor and Twin Twisters. Dawar played Engage to search for Widow Anchor and draw a card. He played it, targeting Kagari, but Flores used his own Widow Anchor to negate it first, preventing Dawar’s Anchor from resolving. Dawar used Shark Cannon to steal a Kagari from the Graveyard, and used it to play Hayate. He entered the Battle Phase at the last moment, attacking directly just as the round timer ended, but it wasn’t enough! Flores had the lead, and was declared the victor! Timothy Flores is victorious with Buster Blader! Check out the YCS Pasadena Prize Wall! 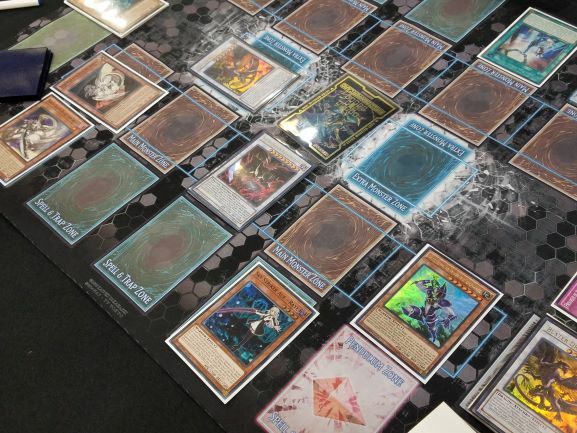 YCS Pasadena: ATTACK OF THE GIANT CARDS! !